The James Burn EX610 Auto Punch has the ability to punch all types of documents. This machine is capable of producing up to 80,000 punched sheets per hour and the punches can be preprinted collated documents with or without mixed stocks up to a 24″ binding edge. This model can also be adapted to work in double action, by punching and tab cutting at the same time! The EX610 can punch virtually any type of stock and material for practically any application. With continuous paper loading speeds and separator beaks that separates lifts of paper without damaging the edge with helps productivity remains constant. This machine features automatic sheet alignment with micro adjustment to get the perfect punch every time. There is a wide range of die patterns available which include: Wire-O, Plastic Coil, Plastic Comb, Velobind, 2, 3, and 4 ring binders. The heavy duty steel dies feature guide posts for perfect alignment, quick pin access, and flanged holes to help clear out waste and add a longer life to the machine. The turnover drum keeps pre-collated document pages in perfect order, and the variable speed conveyor allows for continuous delivery, or deep pile reception. If you have any questions or are interested in purchasing the EX610 Auto Punch, visit us at SpiralBinding.com. 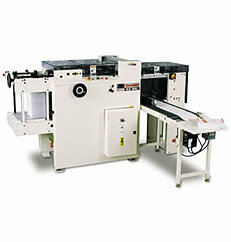 We have great pricing on a full line of Automatic Punching Equipment. Call us at 1-800-631-3572 for more information!